A friend and I dined at Aotoya on a recent Friday night, delighted that it is matsutake (pine mushroom) season. The tri-fold menu has many photos to help diners select, supplemented with numerous handwritten signs on the walls and counter in English and Japanese featuring current specials. Our charming server, Emiko, helped with ordering, and explanations throughout the meal. I ordered the pike mackerel, a long narrow fish which Emiko said is currently in season, $12.95, and my friend had the sautéed pork in ponzu sauce, $17.95. 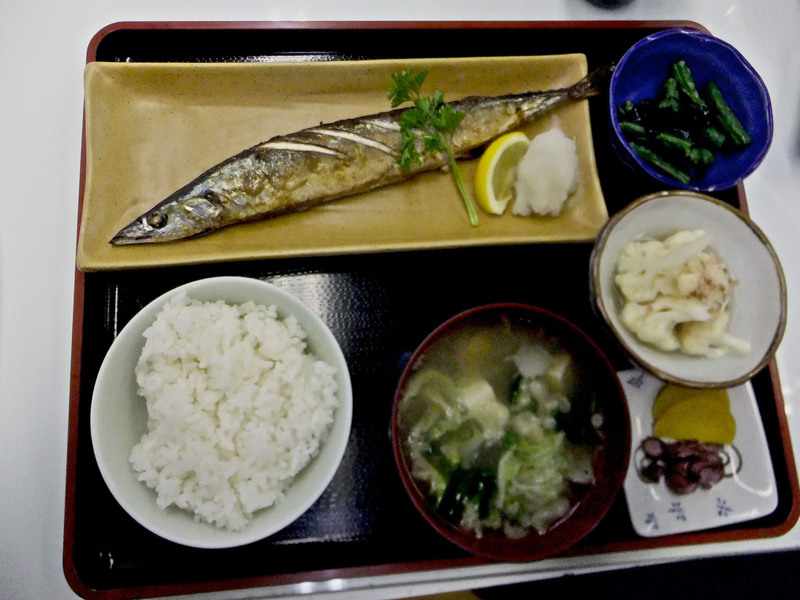 Both were teishoku meals – a meal-set consisting of the main, plus miso soup, rice, pickles, and a vegetable side. My friend upgraded her rice to matsutake gohan for $2.50. 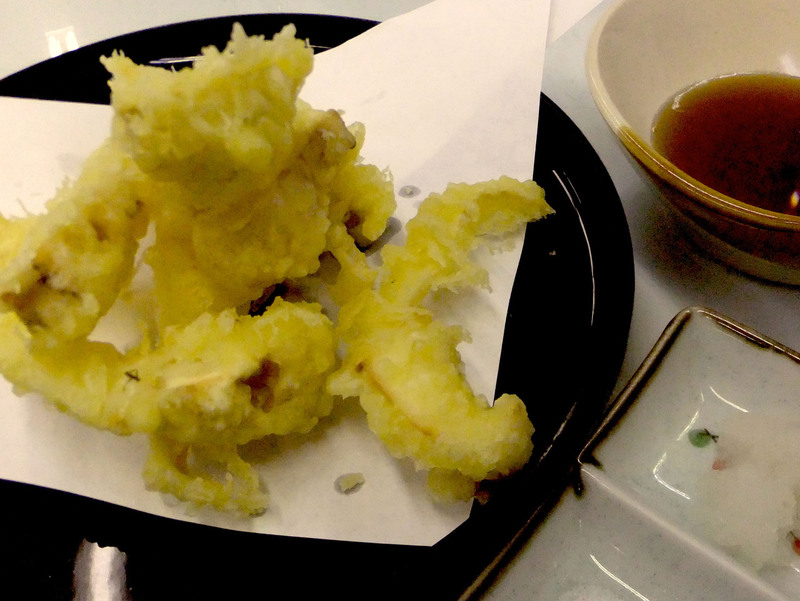 To start, we shared a six-piece matsutake tempura for $7. The crisp battered mushroom was delicious and delicate. It came with salt and oroshii (finely grated daikon radish) in a two-well dish, and a well-flavoured dipping sauce. I was surprised to find my favourite combination was just a little salt, which enhanced the flavour of the matsutake, without overwhelming it. Our miso soup was flavourful and comfortably full of nappa, wakame seaweed, tofu, and chives. This is the kind of real food that could sustain you for a long time. The first vegetable side that night was cauliflower cooked just till soft, in a thick, mildly flavoured dressing, topped with bonito flakes. Green beans came with a little paste of flavoured seaweed. I particularly enjoyed the small pink-skinned pickles, which Emiko explained were made from a kind of small daikon radish with shisho (perilla) leaf. Alongside were two half moons of takuan, a classic, yellow pickled daikon. My pike mackerel was beautifully presented, flavourful and well grilled. The challenge in eating a whole fish like this is to figure out the bone pattern and efficiently remove the fillets without the bones. I avoided the intestinal cavity, although I’m sure my father would have found things in there to eat. For a couple of dollars more, mackerel is available on the regular menu, for those wanting more protein. With our starter, I didn’t need that, plus I had to sample my friend’s meal. The sauteed pork was a generous heap of tender meat, enoki mushrooms, and ponzu sauce. The vinegar in the ponzu grew on me. There was oroshi (grated radish) and green onion mixed in, which provided freshness in taste and texture. Even after my taste-testing, my friend took home about half the pork. Her matsutake gohan was excellent – long strands of mushroom in tan-coloured rice, aromatic with matsutake. Teishoku promotes efficiencies in the kitchen and good value for the diner as most of the components are the same. Aotoya also offers other starters and sides, such as edamame, takoyaki, tofu salad and tempura. 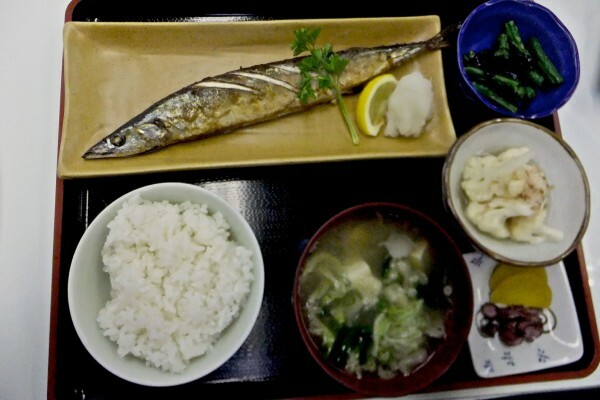 There are mains that can be ordered alone, or for a few dollars more, turned into a teishoku set-meal. Also on offer are donburi (meals on rice) and a selection of udon (soup noodles). Meatless offerings include spicy deep-fried tofu, sansai udon (mushrooms, ferns and vegetables), and a vegetable bento box with vegetable roll, vegetable gyoza, tempura, seaweed salad and fruit. There is even a kid’s bento for $10. I saw signs for matcha custard and ice cream for dessert, but we were happily full at that point. The flexible meal-building and range of offerings will suit a wide variety of palates and appetites. We had called for a reservation and were told that 6:30 was not available, although when we arrived at 6:45, there were only two parties. There are four bench seat booths up one wall, and seating for about 16 more on the other side. Square futon chair cushions were on the benches, reminiscent of my mother’s handmade cushions on our wooden kitchen chairs. By the time we left, most of the tables were full, and the kitchen was busy. I had a brief chat with Chef Mayumi Oda. Her mother was also cooking and helping in the small kitchen, and said they came from Japan 30 years ago. I asked Oda where she learned to cook, and she pointed to her mother. She also explained that this is a family business, and her daughter had brought our food. They used to own Tenhachi, which was in the lobby of an apartment/hotel on West 12th Avenue. 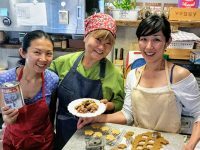 It had a following of Japanese expats and foodies seeking Japanese home-style cooking. Due to building renovations, they were forced to move in January 2013. Aotoya means “blue door”, and indeed, there is a blue door on the restaurant. 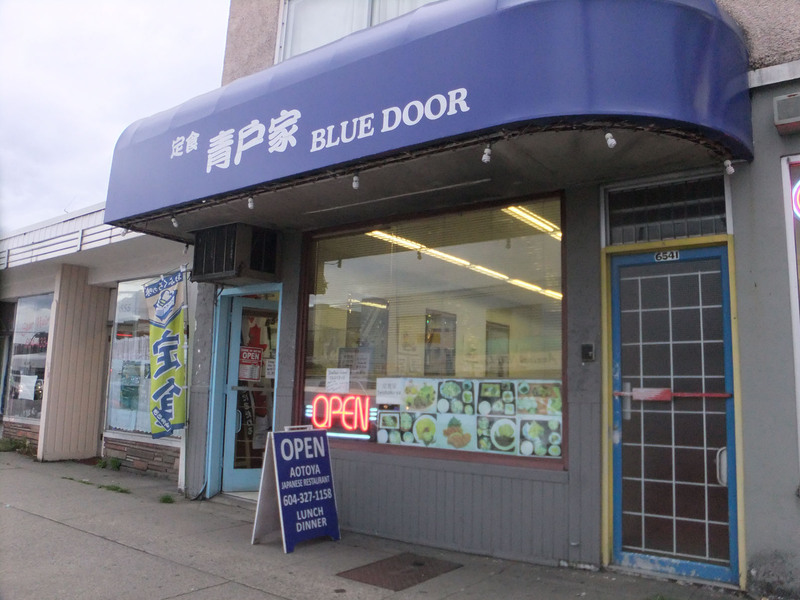 If you’re looking for it on the street, the blue awning carries Japanese characters, and also, “Blue Door” in English. Located in a modest neighbourhood on south Victoria Drive in Vancouver, Aotoya offers good value, for a casual meal of authentic Japanese home-cooking. Lunch: Tue-Sun 11a.m. – 2 p.m.
Dinner: Tue-Sun 5 p.m. – 9 p.m.